The slaughterhouse was packed wall-to-wall with indie game developers from across the Nordic region. I was up on stage to give the welcoming speech. A little nervous of coming across too mainstream, I played Mega64's "IF YOU'RE NOT INDIE F**K YOU" to great effect. Part game showcase, part party and part formal discourse, the Nordic Game Indie Night was a roaring success - especially for the first-ever indie focused activity of the annual Nordic Game Conference. That gathering of dozens upon dozens of indies - including scene darlings like Cactus and Petri Purho - debating and sharing and dancing was in stark contrast to the classic stereotype of the lone wolf basement dwelling indie developer. Jump back the previous month to the Game Developers Conference in San Francisco, and the indie uprising looked assured. Beyond the dedicated Indie Games Summit and the ever inspiring Independent Games Festival, the best party that week was hosted by a small collective of indie collaborators called Kokoromi as a showcase for their annual GAMMA competition. The real irony was that they used the same venue that had been used for the big exclusive PlayStation party in years prior. The positive indie vibe at GDC 2010 was at an all time high, and then Chris Hecker (himself recently reclaiming indie status after one of several EA axe drops over the past year) took to the stage for the annual rant session. 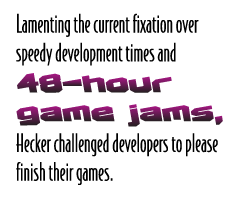 Lamenting the current fixation over speedy development times and 48-hour game jams, Hecker challenged developers to please finish their games. He was very careful to recognize the value of small speedily developed games, but felt there was a lack of games that went deep and fully explored a specific game mechanic. Braid was put forward as the example of taking the time to go deep. Hecker's GDC rant sparked extensive debate and discussion within the indie community. Hecker even posted his email exchange with Jonatan "Cactus" SÃ¶derstrÃ¶m, whom he had mentioned specifically for listing project completion times (some games only taking 4 hours to create). Gorm Lai, a co-founder of the Global Game Jam, is quick to dismiss the idea that what participants are actually producing are games: "We do not necessarily claim that games can be built quickly, however we do claim that most ideas and mechanics can be prototyped quickly to see if it will result in something fun. This is the essence of what a game jam is about; taking a crazy idea and seeing if it will hold. I am not sure many game jam games and to some extent many smaller indie games, should be seen as more than research into a single component of a game." The most recent Global Game Jam had over 4000 participants across 150 locations worldwide and produced nearly 1000 games in 48 hours.